A beautiful day and the blooming of spring brought me out of my stuffy cubicle and into the Herb Garden at the Getty Villa. As the sun streamed onto my shoulders, I inhaled the fresh sent of mixed herbs and flowers—basil and thyme, a hint of lavender, a sweet note of chamomile. Like nearly everything at the Villa, this herb garden was based upon the original garden at the Villa dei Papiri in Herculaneum. The herb garden, or kitchen garden, was typical of wealthy households in ancient Rome. Plants grown in this garden were used for medicinal, culinary, aromatic, and religious purposes. The Villa’s Herb Garden today contains many varieties of the herbs we all know and love: mint, basil, thyme, oregano, marjoram, and sage. But it also showcases plants that were used in ancient times for surprising purposes. 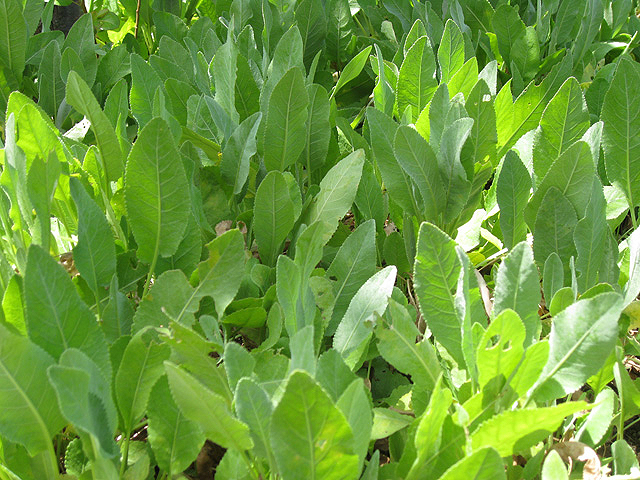 For example, costmary is available today, but rarely used. In ancient Roman times, the leaf of this plant was often used as a sedative tea. Later on in the Middle Ages, the leaf of this plant was typically used as a bookmark. (Side fact: this botanical bookmark was primarily used in the Bible, the most widely distributed book at the time, thereby earning it the nickname “Bible Leaf”). It was especially useful for this not only because of its long, flat leaf, but also because of its properties as a silverfish repellent and an instant “pick-me-up” when its minty smell was inhaled—so you wouldn’t fall asleep during those long sermons. 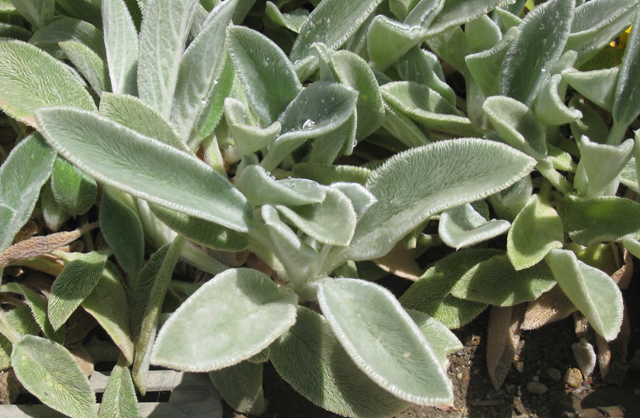 Another plant used in ancient times was lamb’s ear. This plant produces unbelievably soft leaves (hence the name), which ancient Mediterranean peoples used as a bandage for wounds. 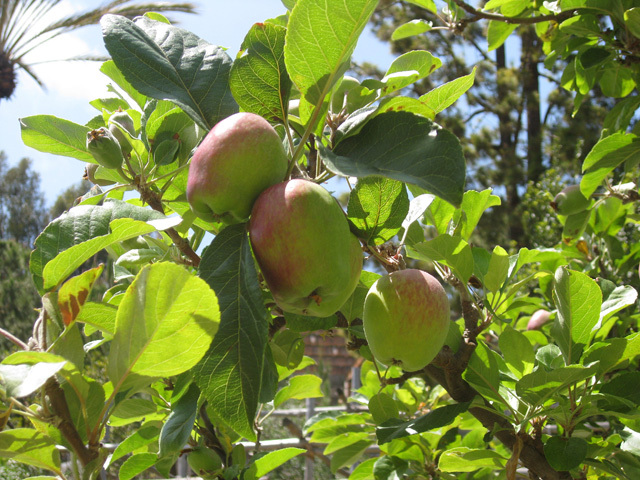 The Herb Garden also boasts a number of fruit trees, including apple, pomegranate, apricot, fig, quince, and pear, along with several grape vines that are sure to be plentiful in years to come (right now they are still young and small). 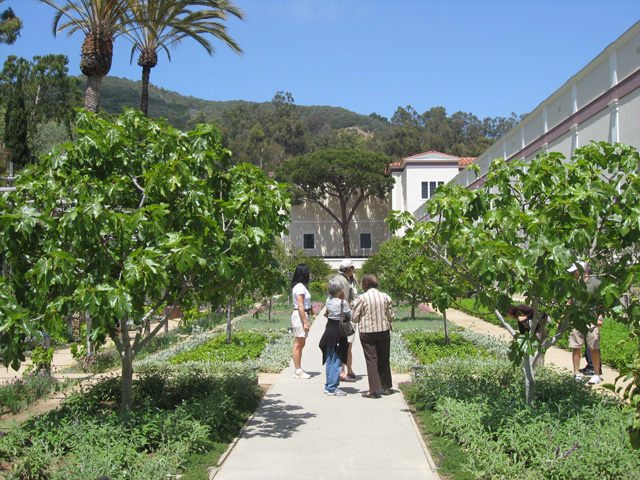 The next time you’re at the Villa, make sure to stop by the Herb Garden, located immediately west of the large Outer Peristyle. Often missed because it can’t be seen from many Villa locations, this garden is a wonderfully peaceful stop on your tour. I'm the marketing project coordinator for the Getty. What does that mean? 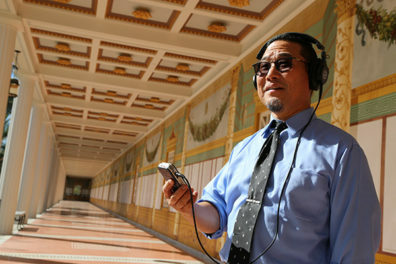 Well, I help develop strategies that aim to encourage people to visit the Getty Center and the Getty Villa. We're trying to wash away the "castle-on-the-hill" image that comes with being a huge museum—on a hill! 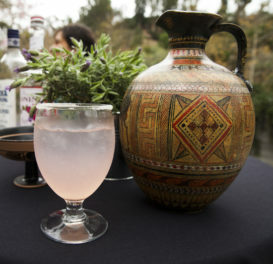 The Getty is a great place to come spend the morning, the afternoon, or the whole day! When I'm not up here on this hill, I enjoy hiking all different hills, listening to music, going to concerts, and watching the final season of LOST. Can you tell me what cultivar of lavander is planted under the white arbor in the sculpture garden near the tram. There is a patch of green-onion like plants at the Getty herb garden. But unlike other green onion plants with flower like seed pods, the plants grow several small bulbs at the tips of the leaves. I’ve always thought bulbs divide slightly below ground. Never have I seen leaves sprout bulbs at their tips. Can sometime please tell me what kind of plant/herb this is? It would make a addition to my own herb garden. They are Egyptian Walking onions. When the bulbs mature on the stem tops, they dry out and bend over with the weight of the bulbs. The news bulbs sprout and so, the common name, walking onions. They grow year after year and the green stems can be harvested and used like green onions all year long. Hi Kim, I really appreciate your post and love the Herb garden! I was there again this past weekend and asked an employee if the herbs, fruits or other produce were being used for cooking at all. I was extremely surprised to learn they are not. Would the getty be interested at all to start a program like this? I know plenty of food banks, restaurants that use local produce, or even public schools that could really use the amazing stuff grown at the villa! The lavender is from a seed packet from a Santa Barbara nursery/florist. Except for the garden with the succulents I planted all the plants at the Getty and the Getty Villa in the early 1960s. My idea for the tram and the parking garages at the Getty and the Getty Villa. Also, the areas for offices and other non-vistor areas at both were added on to the design by me, me feeding the architect about those items, plus the research/education building in back at the Getty. After getting to get to know me Mr. Getty pretty much let me add on what I wanted, including much of the glass doors and separation panels. When the the original floor marble started to arrive at the Getty cracked I choose replacements from local Los Angeles area stock wherever I could find some. Not quite as good a color scheme as originally planned but good considering the alternative. 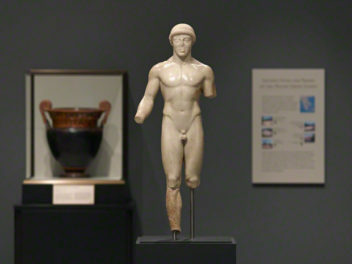 I chose the original marble at the Los Angeles County Museum Of Art and the Santa Barbara Museum Of Art and much of the Norton-Simon and some other California museums, myself raising the money to pay for the work-no charge by myself on any museum work. Thank you for this informative site! Do you happen to know the varieties of ornamental oreganos and their sources? Hi Diane, The three varieties of oregano in the garden are: Dittany of Crete (Origanum dictamnus) from Crete, Sweet marjoram (Origanum majorana) from southwestern Europe and Turkey, and classic oregano (Origanum vulgare) from the eastern Mediterranean. I spoke with Michael DeHart, our expert on all things garden, and he let me know that the longevity plant is also known as Acanthus mollis. The common name is bear’s breeches. Great plant! The palm trees are date palms. The botanical name is Phoenix dactylifera. Glad you enjoyed the Herb Garden! As we entered the beautiful herb garden I noticed two small trees across from one another with gorgeous orange/red flowers. Were they fruit trees? Were they pomegranate trees? Can you give me their name and would it be possible to purchase one from a nursery you might suggest. The trees described is, indeed, a pomegranate. It is the common one that was available 40 years ago when it was planted in the Herb Garden. It is, however, a double flowering type. Most Southern California nurseries would be able to find this tree. 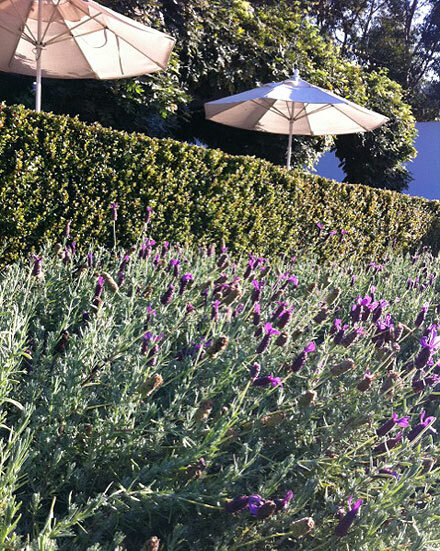 Hi, Can you please tell me what the Lavender plants are called that are planted in the Herb Garden of the Villa? I love how the flowers are on the ends of long stems and appear to be floating above the plant. I would love to get some of these and plant them in my garden at home. I believe several years ago I saw a creeping thyme in the herb gardens there and took a picture of the varietal name… unfortunately I was just looking for the photo and can’t find it. could you help me? Michael DeHart, our grounds and gardens supervisory, always has the answers – I am a mere conduit. At any rate, you are looking for: Thymus serpyllum. Hope it can work for you in your garden! Recently had a tour of the herb garden! thank you so much. It was really a wonderful experience and I am now going to plant some of these herbs! I absolutely love the Getty’s garden in summer. I recently started cultivating fig trees because aside of all their ornamental leaves they have a delicious food. I was wondering that it would be a great to ask if when the the museum’s fig tree is prune if it’s possible to get some of the cutting to have a small piece of the museum growing in my backyard. Sorry, we cannot offer a cutting! But we are so happy you enjoyed the garden. Fig trees are available in many different fruit types, harvest seasons, and heights, and you may wish to consider your specific location and what would be best. Figs can be black, brown, dwarf, or very tall! Fortunately, in Southern California they are strong growers and can be rewarding trees for many years.